In the production of clothing, there is a multitude of stages that can prove highly damaging to our natural resources. Stages of manufacturing that the everyday consumer might be oblivious to. But, the plain and simple red blouse you see sitting on a rack in a store tells a detailed story between its fibres; from its repetitive washing and rinsing to the treatment of harsh chemicals and blending of plastics. Currently, Australians are the second largest consumers of textiles, buying on average almost 27 kilograms of new clothing each year (ABC Radio Melbourne, 2017). Whilst, it is projected that between 2015 and 2050, over 22 million tonnes of microfibre will be dumped into the ocean. (Ellen Macarthur Foundation, 2017). This, alongside today’s rapidly-changing and unpredictable climate, shows being green and making conscious, sustainable choices about the garments we buy and wear has never been more important. However, in order to facilitate change, we need to adapt our chain of consumerism, placing a demand on bettering the standard that our products adhere to. We love fashion and we want to continue wearing and producing beautiful, luxurious clothing, but how do we help in working towards a greener industry? 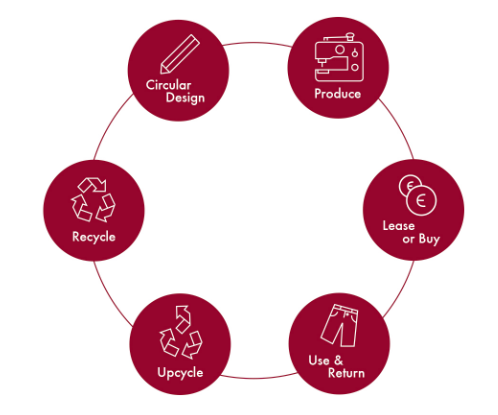 The Circular Economy – what is it? The way in which we consume can be described as linear. We seem to take, create and then dispose. Think of a flower. It is organically produced, growing from the ground, eaten by bugs and animals requiring the nutrients, and then naturally decomposes; ready for the cycle to begin again. Our world is created around a cyclic system, however, in the process of creating man-made products, our natural evolution has inadvertently taken a backseat, sadly leaving our natural resources to suffer. Adapting The Circular Economy would challenge the way in which we use our products and the way mass-companies choose to produce. Here, once a product has reached the end of its lifespan, it would be returned to the manufacturer, recycled and 100% of its materials would go back into creating its newest version. MUD Jeans is a European label that has been implementing such a replenishment cycle since 2013. See how they implement the circular system! Circular Design- In the circular economy, products are designed to be reused easily. That’s why we don’t use leather labels, but printed ones instead. Produce- We don’t use conventional cotton. Our mills are BCI and GOTS certified. Recycle- Worn out jeans are shredded, cut into pieces and blended with virgin cotton This is how a new denim yarn is born. Lease or Buy- Lease our jeans or just buy them directly online or in one of the stores. Upcycle- Returned jeans are upcycled and sold as unique vintage pairs. Use & Return- Take them wherever you go, but send them back at the end of use. Is clothing rental the way of the future? Leasing clothing has proven to be a new and innovative business model that keeps sustainability at the forefront within the cyclic system. Here, businesses handpick and select garments to be rented to customers. Upon return, the garments are dry cleaned and put back on the rack for the next customer to enjoy. Clothing rental has proven to assist in the longevity of clothing, reducing one-time-wears, with most clothing rental businesses even implementing greener processes of dry cleaning. Check out a few of our fav Australian based clothing rental companies below! As proud leaders in ethical fashion in Australia, we would love to see more and more of our startups considering the lifecycle and big picture when developing the design concepts. Consumers today are more than ever receptive to an ethical or sustainable option. Now is the time we can all make a difference.